It is a joy to be with you this morning. Thank you, Tom, for inviting me to preach. 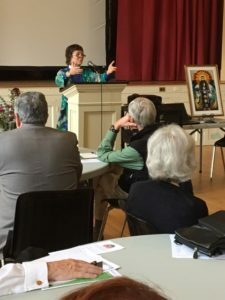 As you may know, I serve as Missioner for Creation Care for this diocese and also for the United Church of Christ in Massachusetts, which means that I go from church to church, preaching the Gospel and speaking about our call as Christians to love and protect the Earth that God entrusted to our care. This is a great day to be visiting the Cathedral, the center of worship in our diocese, for we are right in the center of Creation Season, which began several weeks ago with the Feast Day of St. Francis on October 4 and will extend for several more weeks, until the first Sunday in Advent. As I pondered the readings for this morning, that line from Paul’s Second Letter to Timothy leaped off the page: “I have fought the good fight, I have finished the race, I have kept the faith” (2 Timothy 4:7). What’s the context? Paul is apparently in prison, probably in Rome, and he is facing imminent death. As he says in the reading’s first line, “I am already being poured out as a libation, and the time of my departure has come” (2 Timothy 4:6). Paul is preparing to die and he is doing what most of us tend to do when we face our death: he’s looking back over his life, carrying out a life review; he’s glancing into the future, to the life beyond death; and he’s trying to convey what really matters to him. Maybe it’s because I celebrate a birthday tomorrow – and not just any birthday, but a milestone birthday – that I find myself drawn to this passage. Wouldn’t it be wonderful, when we’re on our deathbed, to be able to look back on our lives and to say: “I have fought the good fight, I have finished the race, I have kept the faith!” I imagine the satisfaction that someone who is able to say that must feel. Through his teaching and ministry, through his presence and words, through his death and resurrection, Jesus showed us that love sent us into the world, that love is what we’re made for, that love is what roots and grounds our lives and gives them meaning and purpose. So when we reach the end of our lives and look back, wouldn’t it be wonderful to know that, as best we could, we made that love real in the world around us – that we lived our life in a way that made people as sure of love as they are of sunlight. Now that is a fight worth fighting; that is a race worth finishing; that is a faith worth keeping! Maybe, at the end of our lives, we will hope what Paul hopes – that God has reserved for us “the crown of righteousness” (2 Timothy 4:8) – but today’s Gospel makes it clear that it won’t be a crown of self-righteousness. Two men stand before God in prayer, and it’s not the good man, the man who has done all the right things, who goes home justified with God, in right relationship with God, but the other man, the sinful man who honestly confesses his guilt and beats his breast in repentance, praying “God, be merciful to me, a sinner!” (Luke 18:13) It seems that God sees deeply into the heart. 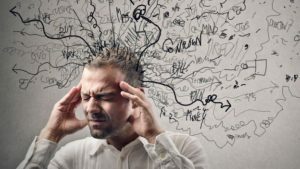 What matters to God is not just outward behavior – that we do good things – but also what goes on inside us: that we don’t exalt ourselves and don’t regard other people with contempt. I find this is a particularly poignant parable in light of this year’s combative and divisive election season, which, across our country and in our own living rooms. is arousing so much anger, fear, and even hatred. Wherever we are on the political spectrum, it’s easy to get caught up in the general mood of self-righteousness, mockery, and contempt. So, as I consider today’s Gospel passage, I imagine the vast tenderness of God, the God who says it’s OK, right here in this sanctuary, to quit all our defensive posing and posturing, to drop all our efforts to promote ourselves, to put ourselves forward and to make ourselves look good at someone else’s expense. I imagine the gentleness of God, who wants nothing more than to come to us, as God came to that wretched tax collector, and to touch that place within us where deep down we know that we can do nothing without God and that in fact we are nothing without God. It’s when we put down our weapons and come before God with an undefended heart that we finally discover how loved we are. Whenever that happens – when we let God’s love reach us in that place where we feel most vulnerable and afraid – a great answering love rises up in us, a love for ourselves and for our neighbors and for the beautiful, fragile Earth upon which all life depends. Jesus knew a love like that, a love that encompasses the whole Creation. Jesus obviously lived close to the Earth: his ministry began by immersion in a river and he prayed and lived and walked countless miles outdoors. In his parables and stories, Jesus talked about God in terms of natural things: seeds and sparrows, lilies and sheep, rivers, wind, and rocks. Jesus was deeply aware of the sacredness of the natural world and it’s no wonder that in our sacraments we, too, make contact with simple earthy things, with bread and wine and water. We trust that God is in these things – that when we take in the consecrated bread and wine of the Eucharist, we take in God’s presence. Like most Christians, I didn’t grow up hearing very much about how God’s love extended to the natural world. But because of the ecological crisis in which we now find ourselves, as Christians we need as never before to renew and reclaim our care for God’s Creation. The web of life is unraveling before our eyes. In just 200 years – a blink in geologic time – human beings have burned so much coal, gas, and oil and released so much heat-trapping carbon dioxide into the atmosphere that atmospheric levels of CO2 are higher today than they have been for millions of years. Scientists warn with increasing alarm that our atmosphere is warming more rapidly than expected and that climate disruption is already evident worldwide. 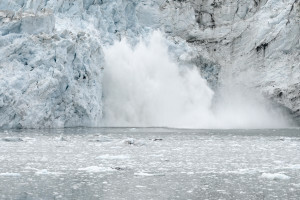 Already oceans are heating and becoming more acidic; tundra is thawing; ice caps are melting; sea levels are rising; coral reefs are dying; massive droughts are spreading in some places and heavy rains intensifying in others. We’re on the edge or in the midst of what some experts call the sixth major extinction event on this planet. 2015 was the hottest year on record, shattering the record set just the year before, and 2016 is right on track to set a new record for heat. The world community is beginning to grasp that the situation is urgent. Last December nearly 200 countries pledged in the Paris Agreement to reduce their carbon emissions, agreeing that the Earth must be prevented from warming more than an average of 2˚ Centigrade (or 3.6˚ Fahrenheit) above pre-Industrial levels – and ideally much less than that. That agreement is a start, but the pledges are voluntary, and even if they were carried out, they would be insufficient to avert catastrophe. So, as I’ve said before in other contexts, if we’re serious about wanting to preserve life as it has evolved on this planet, then we’re going to have to work for it – to organize, lobby, vote, pray, invent, create, protest, and push – to do this together and do it fast. 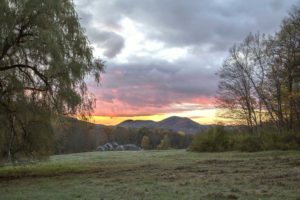 If, at the end of our lives, we hope to say with St. Paul, “I have fought the good fight, I have finished the race, I have kept the faith,” then we need to place care for the Earth at the center of our spiritual and moral concern. For there is a good fight to be fought: we are fighting for a habitable planet and for a safe and healthy world for our children and our children’s children. We are fighting to keep fossil fuels in the ground and to transform our economy so that we are free at last from dirty fuels and are set on a path to a better future. There is a race to be won: we are racing against time, racing to make a swift transition to clean renewable sources of energy, like sun and wind, in time to avert climate chaos. And there is a faith to keep: faith in ourselves and in each other; faith in the God who entrusted the Earth to our care; faith in Jesus who walked and loved this Earth and who reconciled all things in heaven and on earth through the blood of his cross (Colossians 1:20; and faith in the Holy Spirit who guides and sustains our efforts and who makes all things new. On a practical level, what can we do? As individuals, we can drive less, use public transportation, put on a sweater and turn down the heat, ignore the dryer and hang our laundry outside to dry, eat less meat, eat local foods, recycle, and so on. 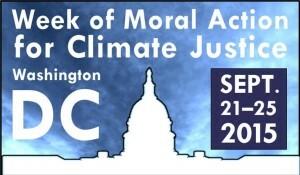 Some people named the week beginning September 21, 2015, the Week of Moral Action for Climate Justice. Others called it Pope Week. I want to call it Watershed Week: the week when Americans streamed to Washington, D.C., New York City, and Philadelphia, like rivers pouring through a watershed, eager to hear Pope Francis speak about our call to love each other and all Creation. The week was a watershed in another sense, too: a turning point where everything changed. I spent most of that week in D.C., swimming through crowds and participating in prayer vigils, concerts, strategy sessions, and rallies. 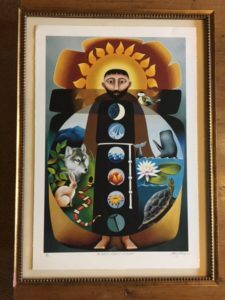 On Monday I gave the opening prayer at the National Prayer Breakfast on Creation Care, an annual event organized by the National Religious Coalition on Creation Care (NRCCC). 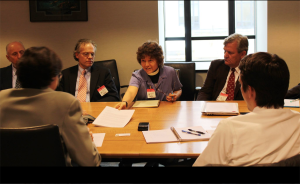 NRCCC is composed of members of all the major religious groups in America, including Catholics and Protestants, Jews and Muslims, Evangelicals and Orthodox Christians. Joined in prayer, and united with people of every religious tradition, we advocate for a right relationship to God’s creation. The NRCCC team gathers for a meeting at the State Dept. We were gratified to hear from the Council on Environmental Quality that the letter was shared widely with the White House climate team. Maybe it will make some waves. From the State Department we headed to the Senate Building to meet with the legal counsel of Senate Majority Leader Mitch McConnell. We gave him an earful about the moral mandate to tackle the climate crisis, citing science and Scripture, ethics and economics. In turn, we listened to his concerns about unemployment in Kentucky and the future of coal. A member of our group pointed out, “Coal is over.” So the question becomes: can Republicans and Democrats work together to make a swift and just transition to a new economy based on clean energy? That is something to work and pray for. 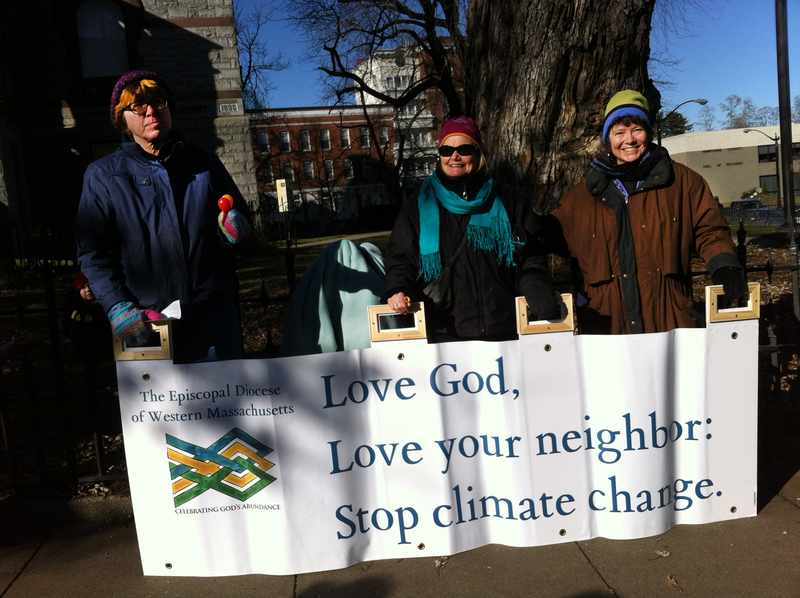 Wednesday began with an interfaith coalition of climate leaders meeting over breakfast with the staff of ecoAmerica. 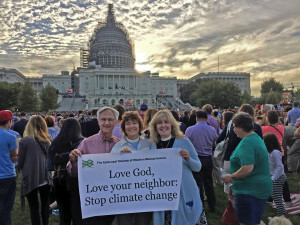 EcoAmerica has been instrumental in developing best practices for climate communication, and its Blessed Tomorrow campaign is mobilizing faith communities to engage in the struggle to stabilize the climate. The offices of ecoAmerica happen to be directly across the street from St. Matthew’s Cathedral, where Pope Francis spoke for one hour to Roman Catholic bishops and cardinals. We relished having the chance to see the Pope as he entered and left the sanctuary. 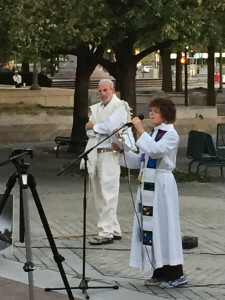 A multi-faith prayer vigil completed the marking of Yom Kippur, and I gave the opening prayer, lifting up Jesus’ cry from the cross as the cry of the Earth-community. and in the silence of dying coral reefs as they bleach in acid seas. At the foot of the cross, we hear the cry of all humanity, and especially the poor, as the climate crisis unfolds around us. 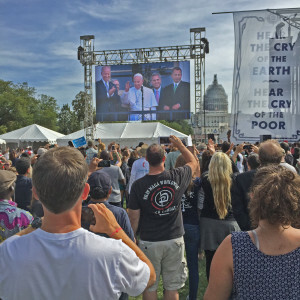 On Thursday morning, I joined thousands of people at a reserved area on the lawn in front of the Capitol Building, to listen and watch on large screens as Pope Francis addressed a joint session of Congress. 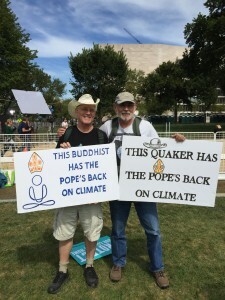 Eventually I moved further back on the National Mall to participate in the Moral Action on Climate Justice Rally, which featured lively music, speakers, and a diverse throng of activists. On either side of the stage stretched two long banners in English and in Spanish, quoting from the papal encyclical: Hear the cry of the Earth. Hear the cry of the poor. A hush settled over the crowd as the Pope began to speak. In a world where so many leaders speak rapidly and evasively, bending the truth to suit their needs and using their words to dominate opponents, defend a narrow, partisan agenda, and push for power, it was rare and sweet to hear a leader speak slowly, truthfully, and from the heart, excluding no one and welcoming everyone. Here was a person whose humility evoked our own basic goodness as human beings, reminding us that in fact we are connected to each other, we do care about the Earth and each other, we do have the capacity to be good, we do have the power to work together and to do the right thing. Was I the only listener moved to tears? I doubt it. That night I made my way on foot to the National Cathedral (forget driving – roads were closed because the president of China was on his way into town). 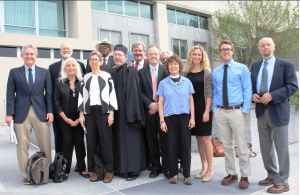 “Coming Together in Faith on Climate” brought together Christian, Jewish, Muslim, and other national religious leaders to express interfaith and ecumenical support of the Pope’s call to action on climate and Creation care. 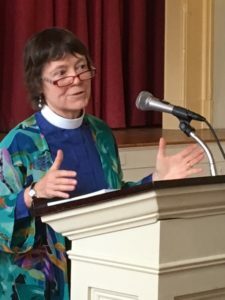 The Episcopal Church’s Presiding Bishop spoke eloquently, and, with the other faith leaders, committed to five initiatives to address global climate change. As leaders of many faiths were endorsing and amplifying the Pope’s message in Washington, D.C., so, too, countless communities beyond Washington, D.C., were also bearing witness to the moral imperative to create a just and sustainable world. 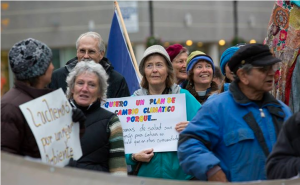 Take, for instance, Springfield, Massachusetts, where, on the same day that the Pope addressed Congress, a rally was held at City Hall to support funding for a climate justice office. Bishop Doug Fisher of the Episcopal Diocese of Western Massachusetts gave a rousing speech. I’ve been part of the religious climate movement for many years, but I’ve never experienced as deep and wide an awakening to the urgent call to stand up for life as I did last week. In order to give our children a livable planet, we need the vision and passion of people of faith – people who can see the long view, not just short-term quarterly or annual reports; people who care about the homeless, hungry, and poor, not just about elites; people who understand that the web of life is a gift to be protected, not a commodity to be exploited and destroyed; people who place their hope not in the promise of success but in the faithfulness of God. People like that are rising up on every side. The image of a watershed may fit this moment in history, but, so, too, does the image of a rising tide. I look back on last week as a watershed moment, because around me and within me I sense a rising tide of activism, resolve, and love. The most inspiring climate song I’ve yet heard was written by Rabbi Shoshana Meira Friedman and Yotam Schachter, and first performed by Rabbi Shoshana and Rev. Fred Small on September 20 – just in time for that pivotal week. They also went on to perform it at the National Cathedral on Thursday night. 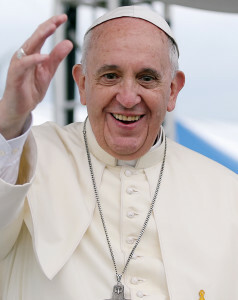 Pope Francis addresses this encyclical to people everywhere: “Now, faced as we are with global environmental deterioration, I wish to address every person living on this planet…. In this Encyclical, I would like to enter into dialogue with all people about our common home.” We hope that indeed people of all faiths will heed his words and take action. As the Pope affirms, climate change is largely human-caused. In keeping with his commitment to the marginalized and vulnerable, Pope Francis emphasizes that climate change has especially devastating effects on the poor. Addressing climate change is an essential aspect of ethics. As individuals we must reduce our personal consumption of fossil fuels; as citizens, we must push for effective governmental and international action. As ordained clergy and as members of the Better Future Project Board of Trustees, we applaud Pope Francis’ call to action. Since its founding in 2011, Better Future Project has been a leader in the climate action movement, empowering grassroots organizing through 350 Massachusetts and leading campaigns for divestment from fossil fuel companies, carbon pricing, and a shift to renewable energy in Massachusetts. We believe that taking swift and responsible action to address climate change is an urgent moral imperative. Last September we walked with faith communities in the People’s Climate March, joining 400,000-plus people in the streets of New York. You might call it a kind of flood — not Noah’s flood, not the flood of a monsoon or hurricane, but a flood of loving determination, a flood of witness and hope for action on climate change. The climate movement is a flood of people calling for systemic change: for sharply reduced greenhouse gas emissions and for a swift transition to clean, safe renewable energy; for the protection of poor and vulnerable communities, for an end to fossil fuel subsidies, and for a strong international climate agreement in 2015. Today we must choose between two floods: the flood of rising seas, or the flood of hopeful and courageous change. As Professor Mercy Oduyoye, an African theologian, has said, unless we take care of each other, we will lose our humanity; unless we become earth-keepers, we will be homeless. 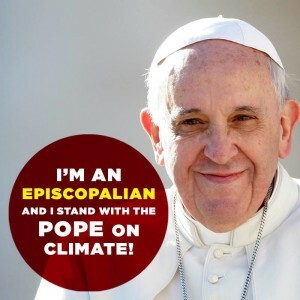 Ban-Ki Moon, the U.N. General Secretary, has asked people of faith to urge bold action on climate change and to “provoke, challenge and inspire political leaders.” We celebrate the release of the Pope’s encyclical, which has done just that. We recommit ourselves to the struggle to provoke, challenge, and inspire political leaders and to mobilize a wave of religious activism to stabilize the climate, heal the Earth, and chart a course to a just and sustainable future. Before Earth Day 2015, Margaret is interviewed by Channel 22 News at a climate rally in Springfield, Mass. There are countless reasons to lament and lose heart. Scan the headlines and take your pick: racism and torture; hunger and sickness; poverty and war; a web of life that is unraveling. I know a woman who heard one piece of bad news too many, and found herself walking around her house, howling. I give thanks for her wails, for her willingness to be pierced by the suffering of the world and to let herself lament. It takes courage to lament. I dispute the injunction attributed to labor organizer Joe Hill, who reportedly said, “Don’t mourn, organize.” I advocate for both: let’s mourn and organize. It seems to me that allowing ourselves to mourn is a good way to keep our hearts supple and soft, and a good way to resist the pressure to go numb. Shedding tears is a way to water the soul. 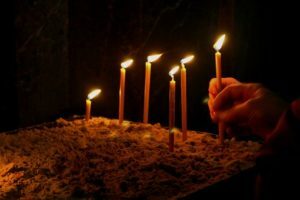 And mourning can be an act of resistance too, a way of shaking off the dominant consumer culture, which prefers that we stay too busy, distracted, and anesthetized to feel a thing. From within our grief, a Spirit is moving among us, inviting us to dream big dreams and imagine new possibilities. Especially in this Advent season, Christians look ahead with hope for Christ to be born afresh within us and among us. What can you do – what can I do – what can we do together – to help this birth take place and to heal a hurting world? How is the Spirit inviting us to join the movement for justice and renewal that is already in our midst, sprouting like tender, new leaves on a tree? Here comes a list of four sightings of the Spirit by just one person in just one week – and an invitation for you to take part. 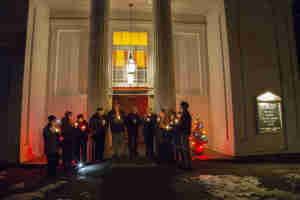 In the hills of western Massachusetts, a small group of people gathers outdoors on a December night. Under a dark sky, we light candles. Surrounded by quiet, we sing. We are only a handful of intrepid souls as we stamp our feet and blow on our fingers to keep warm in the cold night air. But inwardly we are warmed by the knowledge that people all around the world tonight are doing just what we are doing: praying for the climate talks in Lima, Peru. Our #LightforLima vigil on December 7 was one of scores of vigils that were carried out in more than 15 countries on four continents. For two weeks, world leaders met in Peru to lay the groundwork for the climate treaty that will be finalized in Paris in 2015. Coordinated by OurVoices.net, a multi-faith, global climate campaign, the global vigils responded to Archbishop Desmond Tutu’s call to kindle “a light for Lima.” Religious leaders and organizations were vocal at the Lima climate talks. Pope Francis directed a radio address to the President of the conference, calling climate change a serious ethical and moral responsibility. And Anglican bishops prayed and fasted for the climate. Please commit to pray for the success of the U.N. climate talks as we approach the decisive Paris climate negotiations in December 2015. As it stands right now, the deal that negotiators worked out in Lima is not sufficient to prevent the atmosphere from warming more than 3.6 degrees Fahrenheit over the pre-industrial average, the point beyond which the world would tip into perilous, irreversible effects. In the months ahead we will need the sustained, urgent, openhearted, and full-bodied prayers and political pressure of millions of people. 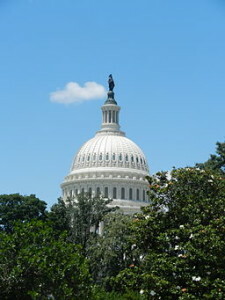 To add your name as a person who will pray, please sign up with OurVoices.net. Leaning forward in a circle of chairs and listening intently, seven Christian leaders from across New England meet in a Framingham retreat house to pray, dream, and strategize. 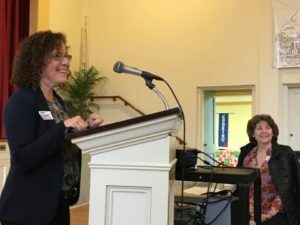 How can the larger group to which we belong, New England Regional Environmental Ministries (NEREM) become a catalyst for societal change and a transformed church? How can we inspire a spiritual awakening in the face of climate change? 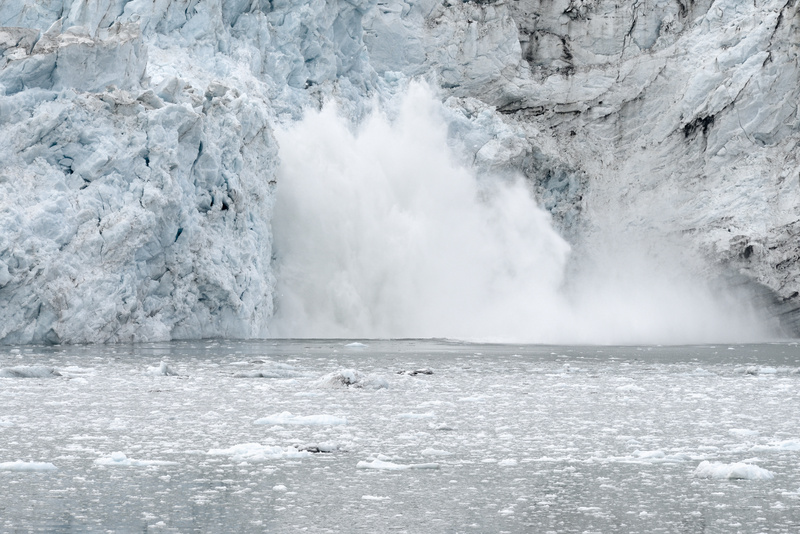 We ponder the fact that hearing a trusted pastor preach about climate change is often what moves churchgoers to accept that climate change is real and to take action to slow it. Yet many parishioners have never heard anyone preach about climate change. In my travels from church to church, I often meet with groups of parishioners and I often ask who has heard a sermon about climate change. In most such gatherings, not a single hand goes up. I won’t disclose what NEREM envisions for next year, but now is the time to start preaching and hearing good sermons about climate change. 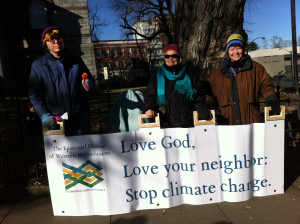 One way for clergy to begin is to sign up to join the National Preach-in on Global Warming, sponsored by Interfaith Power & Light, which will be held on the weekend of Valentine’s Day, February 13-15, 2015. The Website is full of resources, with sermon ideas, prayers, discussion and activity ideas. Or pick another date. The date doesn’t matter. What matters is conveying the urgency of the hour. 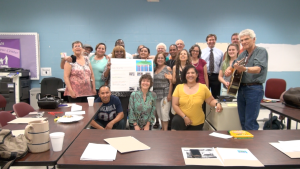 On a Wednesday night in the city of Springfield, Massachusetts, a diverse group of concerned citizens – Hispanic and white, wealthy and low-income – meets to strategize how best to implement and fund a climate action plan for the city. 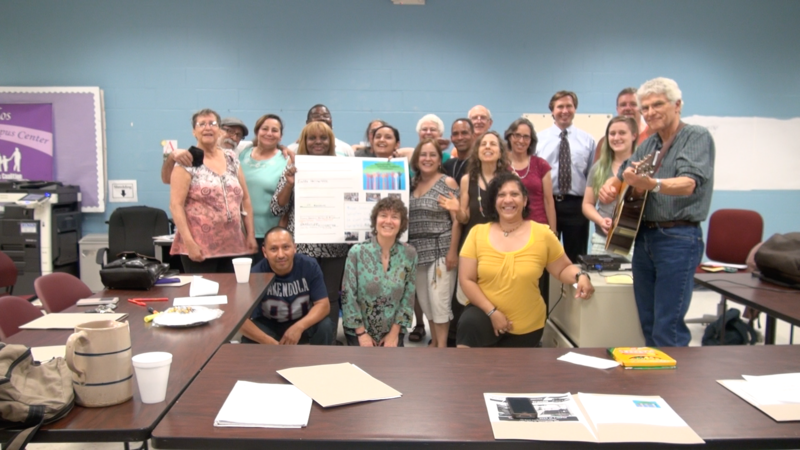 The leaders of this effort – Arise for Social Justice, the North End Organizing Network and Climate Action NOW – have organized the Springfield Climate Justice Coalition. Back in October we held a march through the city’s streets, gathered 200 people for a rally on the steps of City Hall, and rejoiced when the City Council unanimously passed a resolution to adopt a Climate Justice Plan for the city and to establish a staff position to carry it out. Now comes the hard work of building a grassroots base to ensure that the mayor, Dominic J. Sarno, implements the resolution. Over pizza and oranges we exchange ideas, jot notes on newsprint, and start to divvy up tasks. At the end of tonight’s meeting, I invite everyone to stand up and take each others’ hands. I feel awkward. This coalition seems so fragile and new. Can we, should we, pray together? I look around the circle of friends and strangers, take a breath, and speak briefly about the traditional Christian virtues of faith, hope and love. In fighting for this city, we express our faith that we can imagine a better future; we share our hope that we can build that future together; and we manifest the love that gives us strength. I ask God’s blessing on our work, and pray that our work will be a blessing for the city. 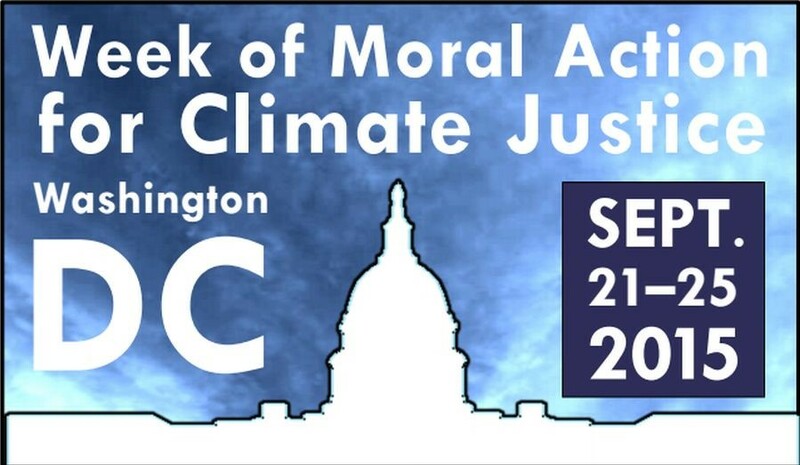 If you would like to join the Springfield Climate Justice Coalition, please contact Michaelann Bewsee (michaelannb (at) gmail.com) of Arise for Social Justice, or Susan Theberge (susantheberge (at) comcast.net) of Climate Action Now. Beside a busy intersection in downtown Northampton nearly a hundred people gather on Saturday for an emergency protest rally to stop the Keystone XL pipeline. A creative spirit is at play among us: the rally features a tuba and an enormous black plastic pipeline, placards full of pointed messages (“There is No Planet B”), and opportunities for singing, chanting, and banging pots and pans to make noise. We mark four-and-a-half minutes in silence, too, remembering that the body of Michael Brown, a black teenager, apparently lay on the ground for four and a half hours after he was shot by a white policeman in Ferguson, Missouri. The movement for climate justice is intimately linked to the quest for social and racial justice. The climate rally’s most combative moments are provided by a loud-mouthed, fat-cat banker who wears a top hat and a suit festooned with fake money. 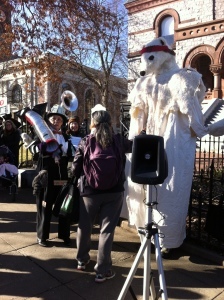 She strides up and down the sidewalk, carrying a mini-pipeline on her shoulder, from which dangles a cloth doll, several small stuffed animals, and the placard “R.I.P.” She launches into a rousing debate with a 7-foot-tall polar bear. Is the Keystone XL pipeline safe? Will it make us energy independent? Will it create lots of jobs? Will it protect the climate? Despite the sneers of Mr. Money-Bags, the patient arguments of the polar bear win the day. The proposed Keystone XL pipeline, which would run from Alberta, Canada to the Gulf Coast, would carry toxic tar sands that would then be shipped for export overseas. The pipeline would allow the most polluting oil on earth to reach world markets. Mining this oil is already destroying the land, water, and health of the people and wildlife of Alberta. The new pipeline creates a risk of spills – the first Keystone pipeline spilled 14 times in its first year of operation. Experts estimate that the pipeline would provide only 50 permanent jobs. And according to NASA scientist James Hansen the pipeline would propel us into a catastrophic level of climate disruption. Thousands of citizens across the country have signed the Keystone XL Pledge of Resistance. Please consider adding your name and pledging to join in non-violent direct action to stop the pipeline. If you wish to participate in and to receive updates about events in western Massachusetts tied to the national Pledge of Resistance campaign – including a training meeting on January 3 – please email Dave Roitman (droitman1(at)verizon.net). We expect to carry out an act of non-violent civil disobedience sometime between mid-January and March. It will be timed so that it happens on the same day that 97,000 other people take action, as part of the national Keystone XL Pledge of Resistance. A short fact sheet about the pipeline by Friends of the Earth can be downloaded here. Who knows what this longing can give birth to now?